Exhibition talk: "The Pope's Other Jobs"
The Lillian Goldman Law Library is pleased to host a talk by Professor Anders Winroth on the library’s latest rare book exhibition, “The Pope’s Other Jobs: Judge and Lawgiver.” Winroth, one of the world’s leading experts on medieval law, is the Forst Family Professor of History, Yale University. 127 Wall Street, New Haven, CT. Cold drinks and dessert provided; feel free to bring your lunch. The exhibition, “The Pope’s Other Jobs: Judge and Lawgiver,” is on display through December 15, 2015, in the Rare Book Exhibition Gallery, Level L2, Lillian Goldman Law Library. It illustrates the Pope’s legal responsibilities throughout history using rare books and a medieval manuscript from the Law Library’s outstanding collection. 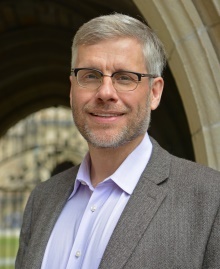 Michael Widener, the Law Library’s Rare Book Librarian, co-curated the exhibition. A catalog of the collection is available for download here. The exhibition is one of several Yale library exhibitions featured in a YaleNews article. October 15 is the final day in Hispanic Heritage Month. The final installment in our Hispanic Heritage Month series is on two fascinating manuscripts from Mexico, which we acquired this month. One of the manuscripts is an investigation of a land deal in 1589, and the other is a lawsuit from from 1777-1782, filed by Indian villagers. While separated in time by two centuries, the lands in question are only a mile apart. They are located on the northeastern fringe of modern-day Mexico City, on the way to the pyramids of Teotihuacán. In addition, both have simple hand-drawn maps with features suggesting they were drawn by the area’s original Nahua inhabitants. The 1589 manuscript collects from an investigation ordered by the Viceroy of New Spain, Álvaro Manrique de Zúñiga, invoving a claim by Hernando Jaramillo to land in Tepexpan (see map). There are depositions from both Indian and Spanish inhabitants, and a lengthy census of all the land owners in the neighborhood. 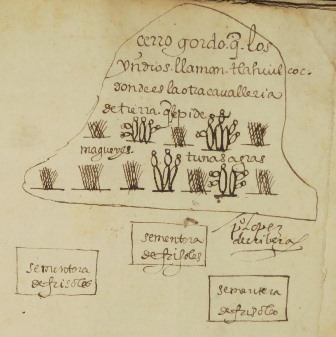 The map includes Aztec glyphs for maguey and cactus pears, to indicate the agricultural production of Cerro Gordo, “which the Indians call Tlahuilcoc”; see the detail shown here at the upper left. The manuscript ends with a criminal accusation by Jaramillo against a neighbor who attacked him and forcibly ejected him from his home. Spoiler alert: Jaramillo won. The later manuscript is a petition by the Indian inhabitants of Iztapa (today called Santa Isabel Ixtapan), just to the south of Tepexpan. They sought to recover lands they claimed had been given them by the Jesuits before the Jesuits were expelled from New Spain in 1767. The manuscript includes a wonderfully detailed map, shown below. Note the trail of footprints that indicate the roadway. My thanks to Salomon Rosenthal of Librería Urbe for his informative descriptions of the manuscripts. Our Hispanic Heritage Month series would not be complete without mentioning our largest single acquisition of Hispanic legal materials in recent memory: a collection 21 volumes containing 25 titles on 19th-century Spanish constitutions, especially the famous Constitution of Cádiz of 1812. The image at left is from the title page of its first edition (Cádiz: Imprenta Real, 1812). “[The Constitution of Cadiz] is often considered one of the first liberal constitutions in Europe and in America. Like the United States Constitution, the Constitution of Cddiz had great influence during the drafting of the first constitutions of the Americas during the independence period. This document, consisting of 384 articles in about forty pages of text, established sovereignty in the nation and not in the king. The Roman Catholic religion received substantial preference under the Constitution, and the practice of other religions was prohibited. The text included provisions that evinced a liberal bias: representative elections at multiple levels of government, restrictions on the power of the king, rights to property, and rights for the criminally accused. Because the Constitution was drafted by deputies representing not only peninsular Spain but also the American provinces, it was the first truly transatlantic constitution, and the American influences on the Constitution and vice-versa have been a subject of substantial speculation, historical scholarship, and debate.” – M.C. Mirow, “Pre-Constitutional Law and Constitutions: Spanish Colonial Law and the Constitution of Cádiz,” 12 Washington University Global Studies Law Review 313 (2013), at 315. 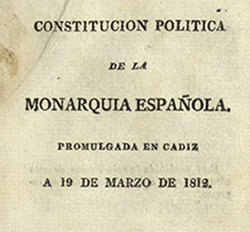 Alvaro Flórez Estrada’s Constitución para la nación española (Birmingham: Swinney y Ferrall, 1810) is a proposed draft of a new constitution by one of Spain’s leading liberals. Flórez Estrada published his proposed draft of a new constitution while in England. At the end is his vigorous plea for freedom of the press. This proposed draft of the Constitution of Cádiz was published in Mexico City, a reminder of its transatlantic reach. Many of the delegates to the Cortes that ratified the constitution were from Latin America. The illustrated edition of 1822 is my personal favorite. Allegorical images depict the adoption of the Constitution of Cádiz and each of its ten titles. In his proposal to Congress, the artist, José María de Santiago, proposed a book that combined the splendor that such a precious text deserved with the convenience of a pocket size. Our copy is the only one in the U.S., according to OCLC. An 1836 Alicante edition of the Constitution of Cádiz, extremely rare, bears the bookplate of María Cristina de Borbón, Queen consort of Fernando VII, and regent for her infant daughter Isabella II. The frontispiece of the Constitution of 1837 (Madrid: Imprenta Nacional, 1837) bears an allegorical portrait of María Cristina de Borbón, depicting her as “the Restorer of Spanish Liberty”. Her regency set off the Carlist Wars, and when her re-marriage to an ex-sergeant in her guard came to light, the scandalized Spanish exiled her to France. Below is a complete list of our newly acquired Spanish Constitutions collection. Hopefully its research value will inspire students and scholars to exploit it. Flórez Estrada, Alvaro, 1766-1853. Constitución para la nación española: presentada a S.M. la Junta Suprema Guvernativa de España è Indias en 1 de noviembre de 1809. Birmingham: Impresores, Swinney y Ferrall de Birmingham, 1810. , iv, 82 pages ; 21 cm. Spain. Comisión de Constitución, 1811-1813. Proyecto de constitucion política de la Monarquía Española presentado a las Córtes generales y extraordinarias por su Comision de constitucion. México: M.A. Valdes, impresor de Cámara de S.M., 1811. 60 pages ; 21 cm. Spain. Comisión de Constitución, 1811-1813. Proyecto de constitucion politica de la Monarquia Española presentado a las Cortes generales y extraordinarias por su Comision de Constitucion. Cádiz: Imprenta Real, 1811. 56 pages ; 20 cm. [With] Continuacion del proyecto de constitucion politica de la Monarquia Española. Cadiz: Imprenta Real, 1811. Spain. Constitución política de la Monarquía Española promulgada en Cádiz á 19 de marzo de 1812. Cádiz: Imprenta real, 1812. 120 pages ; 15 cm. [With] Discurso preliminar leido en las cortes al presentar la Comisión de Constitución el proyecto de ella. Cadiz: Imprenta Tormentaria, 1812. Spain. Constitución política de la Monarquía Española promulgada en Cádiz á 19 de marzo de 1812. Reimpresa de orden superior. Madrid: En la Imprenta Real de Madrid, en el mismo año, . 120,  pages ; 15 cm. Flórez Estrada, Alvaro, 1766-1853. Constitución política de la nación española por lo tocante á la parte militar. Cadiz: Imprenta Tormentaria, 1813. xxxi, 170,  pages ; 15 cm. Spain. Constitución política de la Monarquía Española promulgada en Cádiz á 19 de marzo de 1812. Madrid: En la Imprenta Nacional de Madrid, año de 1813. 120,  pages ; 16 cm. Spain. Constitution politique de la monarchie espagnole, promulguée à Cadix, le 19 de mars 1812. Paris: Chez les Marchands de nouveautés, 1814. , 72 pages ; 21 cm. “Traduit de l’espagnol, par P. de Lasteyrie.” Library’s copy includes two bookplates: (1) Victor et fidelis; (2) Ex-libris Marcel Dunan. Reflexiones sobre la Constitución política de la Monarquia Española: publicada por las Córtes extraordinarias de Cádiz en 1812. Oviedo: En la oficina de D. Fermin Pérez Prieto, año de 1825. , XXXIII, 204 pages ; 15 cm. Spain. Constitución politica de la Monarquia Española promulgada en Cadiz, a 19 de marzo de 1812. Madrid: En la Imprenta Nacional, año de 1836. 120,  pages ; 15 cm. Spain. Constitución de la Monarquia Española promulgada en Madrid a 18 de junio de 1837, impresa de orden de S.M. la reina gobernadora. Madrid: Imprenta Nacional, 1837. 37,  pages ; 16 cm. Added t.p., engraved title page with allegorical portrait of María Cristina de Borbón, regent for Isabella II. Spain. Constitución de la Monarquia Española promulgada en Madrid a 18 de junio de 1837, impresa de orden de S.M. la reina gobernadora. Madrid: Imprenta Nacional, 1837. 25 page; 36 cm. Added engraved title page page with allegorical portrait of María Cristina de Borbón, regent for Isabella II. Our Hispanic Heritage Month series continues with a look at a recent acquisition of a fundamental work in the Hispanic legal heritage of the United States. Curia filipica by Juan de Hevia Bolaños was for over two centuries the essential handbook for legal procedure in Spain and in its New World colonies. Since its first printing in Lima, Peru, in 1603, the Curia filipica enjoyed an extraordinary success, appearing in close to 40 different editions, until its final publication in Paris, 1864. Editions of the Curia filipica were present in virtually any collection of law books in Spain’s colonies. It was owned and consulted not only by lawyers and judges, but also by a wide range of local officials with legal responsibilities, including city officials, garrison commanders, priests, and merchants. It was one of the first law books present in modern-day Texas, listed in the 1800 will of a military chaplain in San Antonio, then a Spanish frontier outpost. It is cited in over a dozen early cases in Louisiana, Texas, and the U.S. Supreme Court, as an authoritative source on Spanish procedure. The copy we acquired is Curia filipica, primera y segunda parte (Madrid: En la Imprenta de Geronimo de Estrada, 1700). The “second part” is another work by Hevia Bolaños that was originally published separately, Labyrintho de comercio terrestre y naval, which was for decades the only available work in print on Spanish commercial law. Begining in 1644 it was published as the second part of the Curia filipica. Many scholars now doubt that Juan de Hevia Bolaños is the real author of these two works. The best study of him is Guillermo Lohmann Villena, “En torno de Juan de Hevia Bolaño: la incógnita de su personalidad y los enigmas de sus libros,” Anuario de historia del derecho español 31 (1961), 121-162. He was born in Oviedo, Spain around 1570, and came to the New World in 1594, spending several years working as a scribe and minor court official in Quito before moving to Lima. Lohmann Villena found no evidence that Hevia Bolaños had a university degree, or that he had much of a professional career as a minor legal functionary. He died poor and with no family. One contemporary account describes him as a heavy drinker. It is hard to believe that someone like him could have authored legal texts of such erudition. In addition, close examination of the text by Lohmann Villena indicates that the text was written in Spain and not in the New World. No matter who wrote it, the Curia filipica is an indispensible source for study of the early legal history of the Southwest U.S. 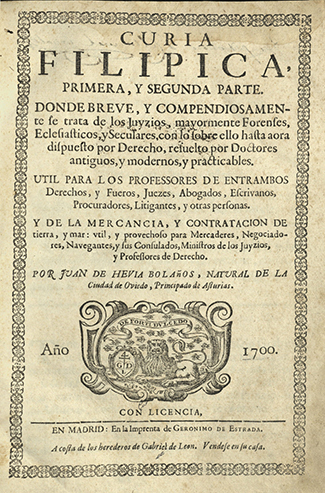 Contents and printing license for part 1 of Juan de Hevia Bolaños, Curia filipica, primera y segunda parte (Madrid, 1700). The next acquisition in our Hispanic Heritage Month series is a catalog of judicial sins in colonial Mexico. 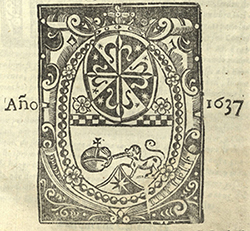 Reglas ciertas, y precisamente necessarias para juezes, y ministros de justicia de las Indias, y para Sus confessores (Mexico: en la Emprenta de Francisco Salbago, Ministro del Sancto Officio, 1637) was written by Fray Jerónimo Moreno (1561-1631), a Dominican friar. This acquisition was purchased with the Gertrude (Gigi) and Arthur Lazarus, Jr. Fund. In his introduction, Moreno writes that he was inspired to describe the typical sins of New Spain’s judges as a service to the priests who heard their confessions. He described the judges as for the most part unjust and corrupt, and unrepetent of their sins against the Indians. Compounding the problem were ignorant confessors who made little effort to examine the consciences of the judges. Among the sins that Moreno lists are conflict of interest, bribery, intimidation, extortion, wage theft, and price gouging. He cautioned priests that these unjust judges could receive absolution only by confessing these sins and by paying full restitution to those whom they had cheated and abused. In his denunciation of abuses against the Native Americans of the New World, Moreno followed in the footsteps of Dominicans such as Bartolomé de las Casas and Francisco Vitoria. Fray Jerónimo Moreno was born near Seville. Upon entering the Dominican Order he was sent to the University of Salamanca and earned a reputation as a brilliant student. In 1595 he arrived in Oaxaca, where he preached and taught theology. In 1627 he was named as the head of the Dominican province in Oaxaca. The first edition of Moreno’s Reglas ciertas was published six years after his death. A second edition was published in Puebla in 1732, and in 2005 Mexico’s supreme court published a facsimile edition of the 1732 edition. For a detailed analysis of the book, including a biography of the author, see Alejandro Mayagoitia, “Notas sobre las Reglas ciertas y precisamente necesarias para jueces y ministros de fray Jerónimo Moreno, O.P.”, Anuario Mexicano de Historia del Derecho 8 (1996). Hispanic Heritage Month (Sept. 15 to October 15) is an opportunity to highlight a number of recent acquisitions. First up is Justice for Salcido (1948) by Guy Endore (1901-1970), a novelist and screenwriter best known for his 1933 novel The Werewolf of Paris and his Oscar-nominated screenplay for The Story of G.I. Joe (1945). Endore was also active in left-wing politics. Manuscript and finished pamphlet for one of Endore’s scarcest works, an indictment of the Los Angeles Police Department following the shooting death of an unarmed 17-year-old Mexican boy, Augustin Salcido, on March 10, 1948. The subsequent trial (which Endore discusses in great detail) resulted in the exoneration of LAPD officer William J. Keyes, and was considered a major blow to the nascent Chicano-rights movement. The case became a cause celebre for left-wing groups in the Los Angeles region. Endore (best known for his 1933 novel The Werewolf of Paris), maintained a lifelong affiliation with the Communist Party, though he managed to largely escape the Red Scare of the McCarthy era. He generally resisted overt political themes in his writing, the current work and a few other political pamphlets being the exceptions. Justice for Salcido has long been a scarce and sought-after work in the Endore canon. Side-by-side comparison reveals significant differences between the manuscript and the published version, including the elision of an entire preliminary section and the toning down of Endore’s references to LAPD officers, who are frequently described as “psychos” and “sadists” in the manuscript (in the published version, they become “blackshirts” and “fascists”). A significant manuscript from an important, if under-recognized, American novelist. Thanks to Lorne Bair Rare Books for permission to share their description. Endore, S. Guy, 1900-1970. 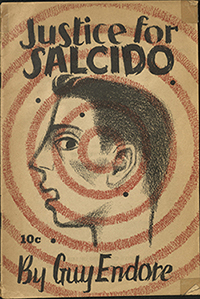 Justice for Salcido [mimeographed typescript, 1948? ].